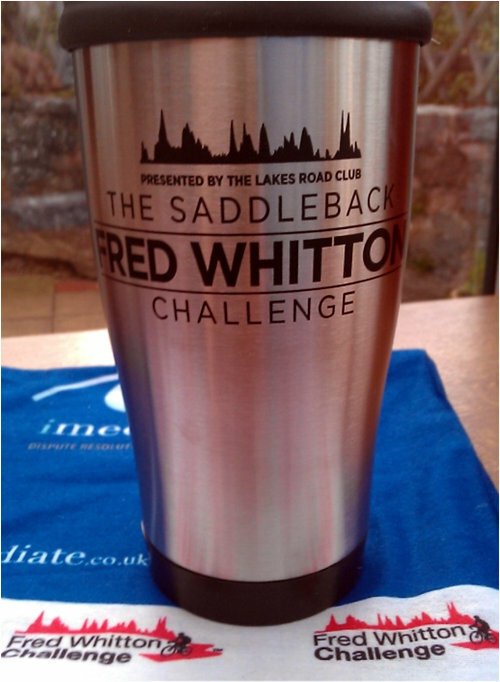 VC Melyd had no less than 17 entries for the Fred Whitton Challenge 2015. As they are offered up I will be posting them here for you to read through. A tough event, less than ideal conditions from rain to strong wind, and all the usual Lakeland highland passes over 112 miles and 13 000ft. Times falling between seven and twelve hours it was a rough, but emotional day for all. We woke/stirred about 5 a.m, some of us slept, many of us did not. To my amazement there were people already leaving as we got up to prepare for the day, we showered, dressed, ate and then off we went. The queue of people arriving was long, the weather wet and faces of the passing riders so very miserable. We looked at each other and began to wonder just what had we let ourselves in for. Needless to say this would not put us off, we parked double checked all we has was what we needed and headed off for the start/finish line. Pockets packed with food stuffs of all types, bottles filled tot he brim with all sorts of magic concoctions to see us through the day…….I was beginning to get a little apprehensive, it was going to be a big day and already it was wet. I was under dressed for the weather as it was and the forecast was horrendously wrong as it was, what could we expect later on. It was too late now, over the line we went, a small group of us riding together and keeping one another company through the day. We clocked some miles, my mood got better and it seemed like maybe I was going to be okay, maybe my clothing was suitable after all. The rain stopped, the temperature rose. We got to the first noticeable climb, it’s name escapes me, names really aren’t my strong point but we rode it and it was fine, I was warm, slightly wet but warm, it was good. We stopped at the top for a quick top up of energy foods and to wait, eating is so very important, this I had drummed into myself before the outset. We re grouped and off we set down the very steep descent, a marshal shouts “steady, there’s been an accident half way down!” This made me nervous, I am already not good on descents on wet or damp roads, they make me nervous! I tentatively descended behind my fellow riders, riding within my comfort zone, I didn’t care if they were quicker I could always catch them up if need be but it was okay, there was no need for catchup. I was glad that was over……but I knew there would be more. We rode some more flats and some more bumps, there were riders over taking but that didn’t bother me, I didn’t know the route and would rather be slower and finish than blow before then end. The pace was okay with the odd sprint here and there on the flat and the slog up so many climbs, I was enjoying myself, the weather was holding and the day was going to plan. Then came some more long climbs, steep thigh burning long climbs. We took those in our stride, we were used to those, we live in Wales, it’s just like our back yard. This continues for a few more hours, then the wind begins to pick up, the rain begins to fall heavier, there isn’t a single part of my body that isn’t cold and wet. We stop for a short break, then another of our group randomly appears, I don’t know why I was surprised, he does it all the time. We whine about the hideous weather and then continue on together. We hit another thigh burner, not so much that it makes you want to cry but people are already beginning to walk them, this isn’t a good sign when this is literally half way I think to myself. Up we go, climbing and climbing in the pouring rain, again at the top we are warned about the descent being steep and so very precarious, there are straw bales on the outside of a corner, I feel nervous, I’m on carbon rims, I think to myself please don’t melt as I’m almost constantly on the brakes all the way down. I get to the bottom and all is good, I’m there, we are there and everyone is alive and unbroken. We ride off into the now strong wind, the type of wind that makes wish it would just go away,not strong enough to slow you right down but enough to put unwanted extra pressure on your thighs and sap your energy some more. We trundle on chatting, taking in the utterly breath taking scenery and generally in good spirits despite the weathers best efforts to ruin it, then comes another long hard climb. I ride it at my pace, I loose all recollection of where any of my friends are I just ride, at my pace, in my little world, I see a tent at the top or so very near the top at least and there are many people. I approach and hear the phrase of the day “good effort lad” and someone hands me a kinder bar, within seconds it has gone, then a blue ribband and again it has gone within seconds. I was hungry, so very very hungry, I had run out of food, I was beginning to feel it’s effect and knew I needed a food stop and to get warm. 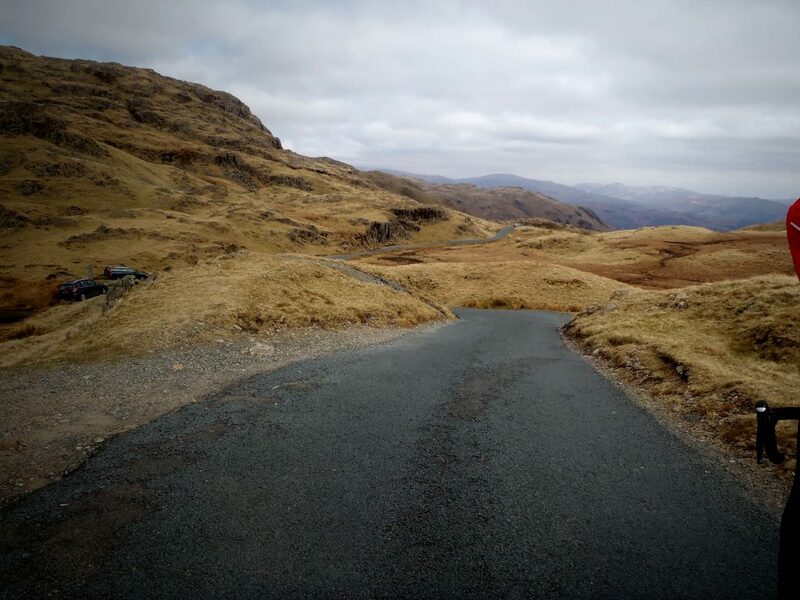 I was aware of what was to come……98 miles in it was there, that one everyone talked about, the one people say the pro’s were walking, HARDKNOTT pass it was known as, the slayer of fatigued riders. I had no intention of walking anything, I’m too stubborn but I was beginning to wonder if I would be anohter one of its victims. We found the next feed station, it had heaters, the feeling was like I had been rescued from a desert island, oh and it had coffee too, it was incredible, a real mood lifter. We met up with more grouo members, chatted, warmed ourselves and then we all set off together for THAT HILL. We rode for a few miles, the weather had broken by this point, it was warmer, less windy and above all not raining. Then it came into sight, I had that feeling in my gut, I knew it was going to hurt. We approached and already people were saying they were walking it. I had no such intention, it wouldn’t beat me, no way. There were two of us riding, myself and a team mate, we rode, we encouraged each other, everyone else was walking, people in the way, I was swerving to avoid but I carried on, we pushed each other, we were determined. I could see the top, I could no longer hear my team mate, briefly I thought I hope he makes it, but then my thoughts go back to me, where I am and how I’m doing. I make it to the top, mashing at the peddles and then there is that feeling, emotional, that feeling like you’ve done something you never thought you really would. I feel truly emotional as I sit back down in my saddle and take it in. 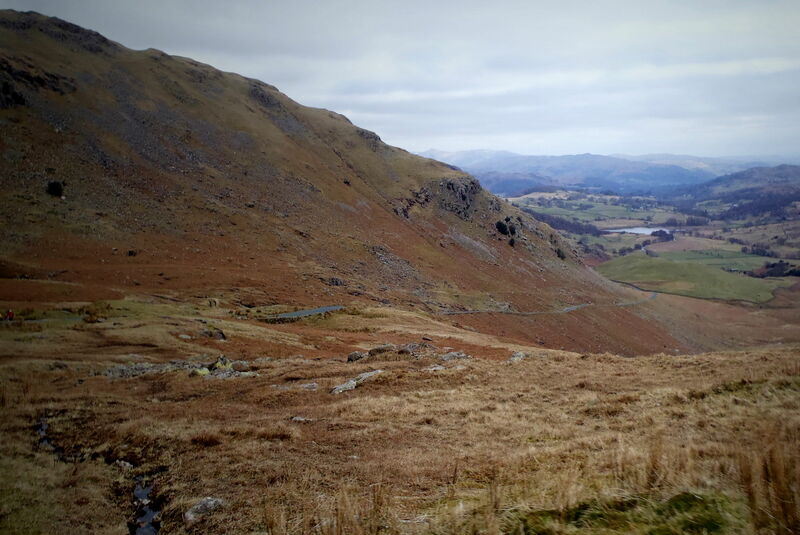 I conquered Hardknott when so so many couldn’t. I did it, for me, for my own sense of achievement I did it, and then my team mate comes over the top, still on his bike, still peddling. I almost well up, it truly was an emotional experience for me, we had pushed one another, we had dug so very deep in the reserves and we had done it! It’s one of those hills, the ones you see people doing and you think wow that really must hurt…..it’s true what you think, they really do hurt, they burn deep within your legs, your arms, they ache like you have been swinging an axe for hours on end as you literally heave yourself up them. You tell yourself not far now, you think of the crest of the hill, you see it, you again tell yourself it’s not far just 50, 40, 30, 20 more yards and I’m there. You can no longer feel the pain in your legs, you’ve switched off from it, you’ve taken yourself to that place in your head where all that matters is the next peddle stroke. 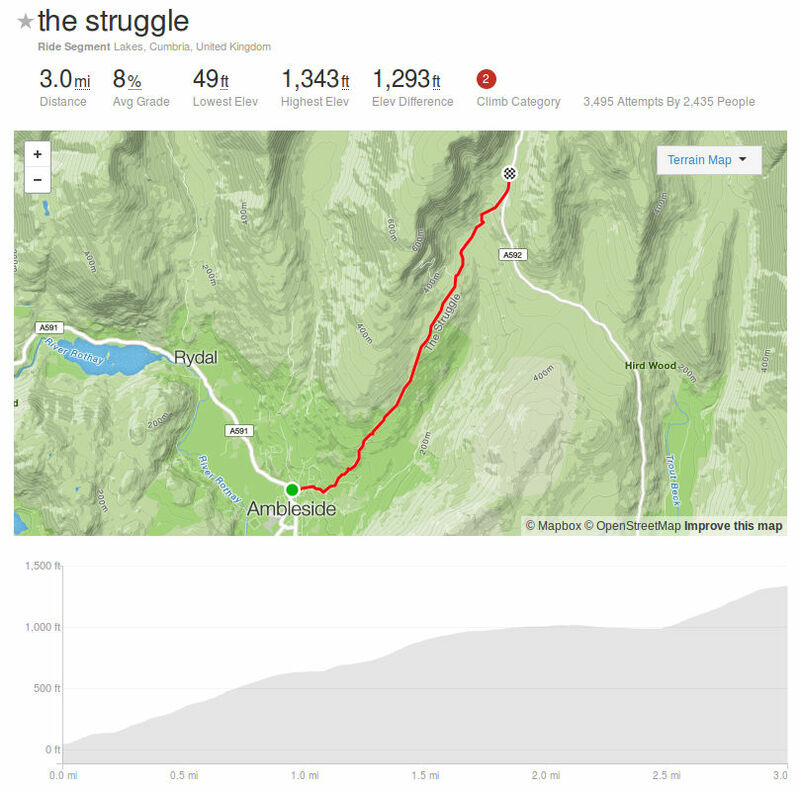 On a short ride I’m sure it would be much much easier but we were doing on the Fred Whitton, it was along way in and a lot of elevation had already been gained. That was it though, it was done, the hardest climb of the day had been conquered. My team mate and I descended the other side, it too was incredibly steep. We rode off, one more pass to do and we could relax. The last one was tough, not for very long but the last couple hundred feet, the legs felt empty, not completely but enough that they whine as soon as it kicks up a little. I zig zag near the top as the pain kicks in, lessen the angle, take some pressure off my broken muscles. We hit the summit and off we go, again down a slightly scary descent but it was almost flat from here, nearly home. You feel a weight lifted as you do it, as you know it’s almost done. The ride so many say is horrendous, is the toughest you will ever do is nearly over. We get to some flat ground and I turn and say to my team mate shall we put the hammer down, he laughs and then off we go. I lead out, from nowhere I have found some energy, where does it come from, how can we always put some speed on at the end of such a gruelling ride. We switch half way thiugh and he takes some pressure off me, then again I am back on point. We over take absolutely everyone we come to, single riders, groups, all of them fair game, not one person managed to keep up or over take us. I still don’t know how we did it but we did. The finish line ws in sight, I hit the roundabout as fast as my legs could push me and there was a welcome sight, another team mate who couldn’t unfortunately do the ride due to injury, I smile, wave and then keep pushing to the line. 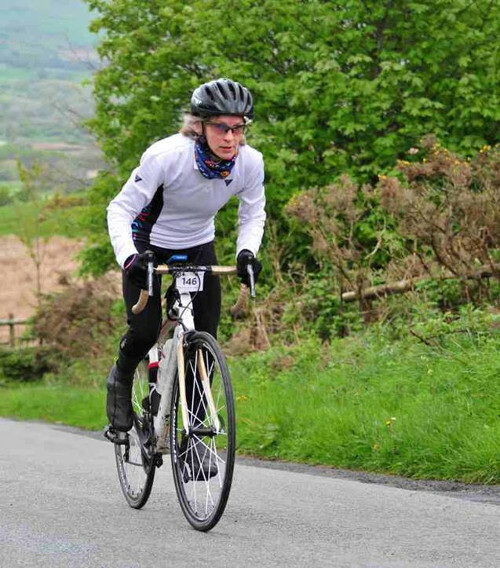 I was done, I was so very very happy, I had ridden the Fred Whitton Challenge. 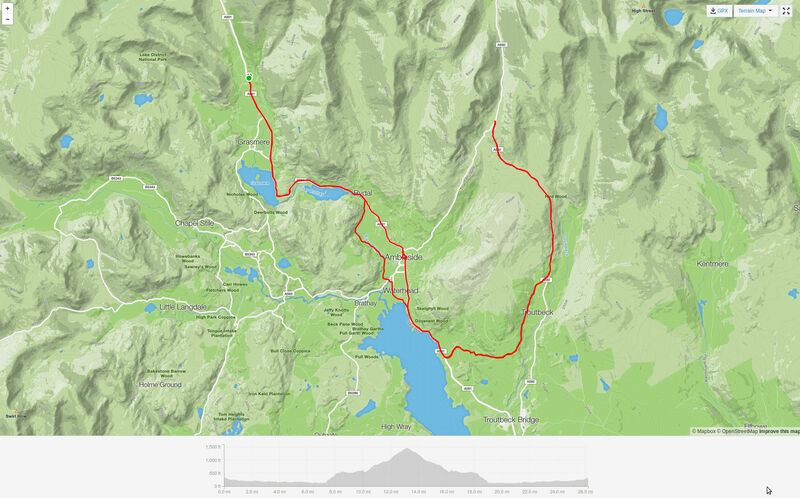 So, 10 days before the event, I was chatting with a pal about our respective cycling challenges, and theorising ‘what next’ for 2016; he thought the Fred Whitton Challenge was ‘The One’ for next year. “Maybe” I thought, recalling the recent VCM Facebook posts about 30% hill climbs as the blood ran chilled through my veins…… Fast forward a mere 8 hours, and I receive a message from my VCM buddy Simon telling me there’s a few spaces available on ‘Fred’ THIS YEAR. He reminds me I’ve been doing the training anyway so why don’t I enter? I’d be very welcome to travel with the VCM team. Oh. And I have to sign up by tomorrow. With just 2 years cycling experience, but a few endurance events under my belt, I feel that my cycling skills are developing. I’m working hard to improve further and enjoy the challenge. 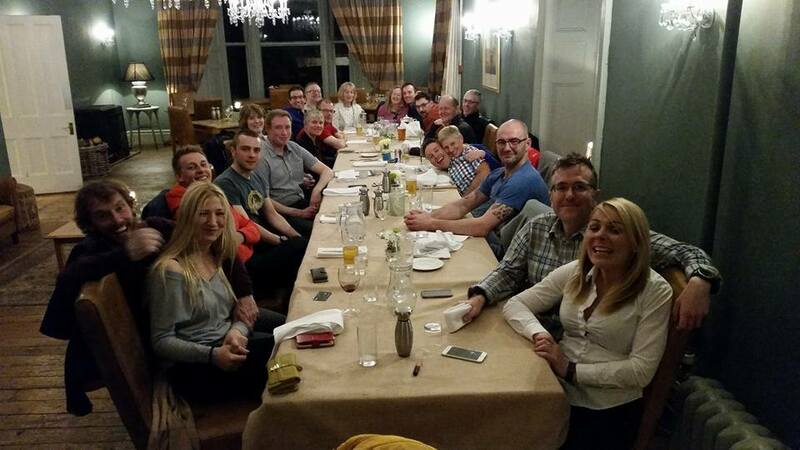 But now we’re talking about me going with the VCM-Supreme-Cycling-Beings to do the toughest cycling event in the UK. 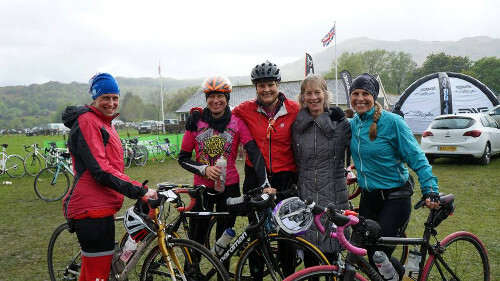 Oh – and did I mention it’s the TOUGHEST CYCLING EVENT IN THE UK? Clearly I said yes. I’m nothing if not determined. With a pinch of deluded. I share the journey to the event with Anthony and Simon. Anthony and I bemoan the pending hills; Simon tells us it’s going to be fine. I meet the remaining VCM members over drinks and dinner that evening. 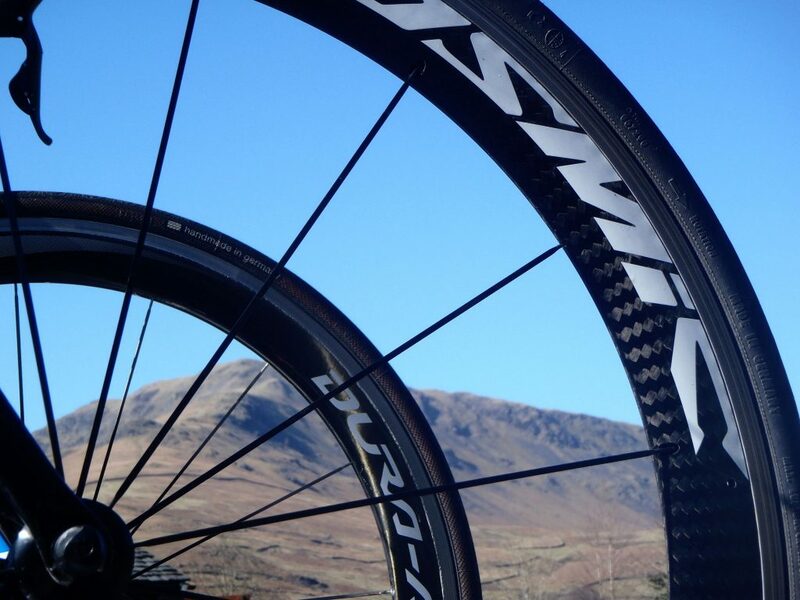 The conversation turns to the best cassettes to use, wheel weight and rim depth…..those hills……and the weather. Fred appears to have a knack of taking place in rather inclement conditions. We all have different weather apps which forecast different elements – we avidly compare and hope for the best. The ladies and I retire to our hostel room where I enjoy an enviable 2 hours of anxiety-induced teeth-grinding sleep. Fran and I are first up at 4.45am – and hey, the weather looks calm! The ride over to the event does nothing to still our nerves as the queue to park hardly shifts. Our hopeful 6.30am start drifts further away; I am substantially slower than my comrades, and if I’m to make the first cut-off, I need to get peddling ASAP. Anyway, finally we start peddling at 7.19am, into the increasingly wet kind of rain infamously characterised by Peter Kay. I enjoy the first few miles with Simon, Anthony and Sally, rambling up a couple of hills and taking a few snaps together before the boys head off with their super speedy legs! Sally and I continue on for about 20 more miles together; in a very short time I learn so much from her that will help me en route. Sally is a FWC veteran; having completed the event last year in just 8:50 she is a heroine in my eyes! Unfortunately, she had a nasty accident 3 weeks before the event this year and her resulting injuries mean she can’t complete the full ride; she just wanted to start with us all and I’m so glad she did. 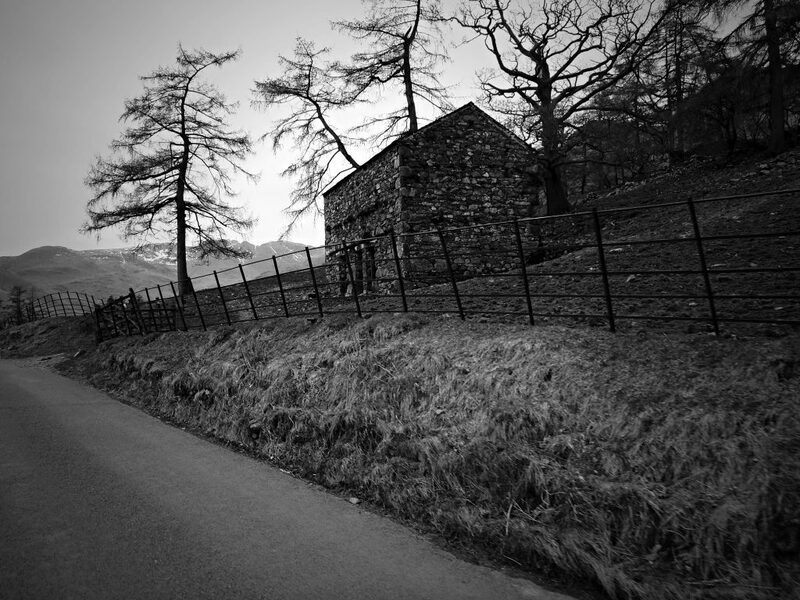 We part company after about 35 miles: she heads back to Grasmere and I make my way to Honister Pass as she tells me I’m on track to make the cut-off, I just have to keep this up……. The ride to Honister is fun. Lots of positive encouragement received from fellow cyclists as they fly past me, and I fly past, well, mostly stationary things. 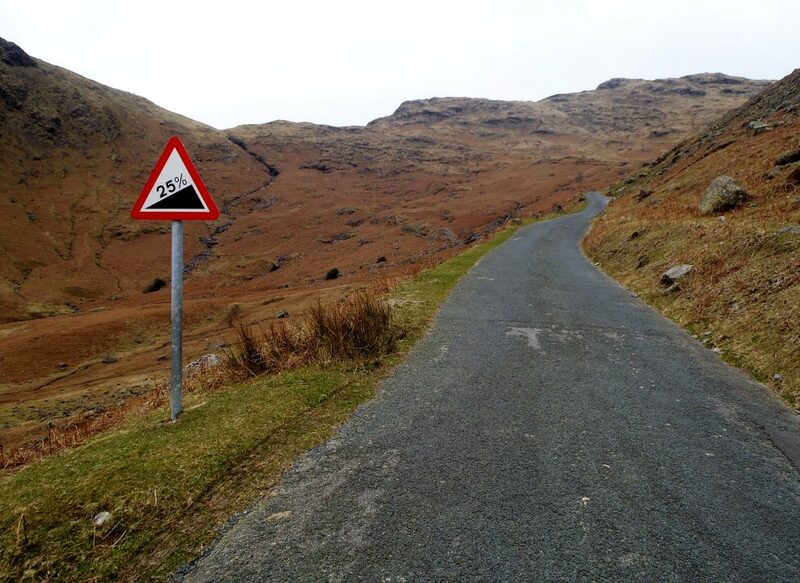 Honister is the first ‘big’ climb comprising some of those nasty gradients. I peddle as hard and as far as I can, determined to pass the 3 burly chaps who are walking their bikes up. And I do! But then I stop because my lungs are bulging inside my throat and I think it’s best to just hang over the handle bars for a few moments while I swallow them back down. One of the guys says: “ah once you’re off you’re screwed”. Humph. You’re talking to Determined and Deluded here Mister! First, I don’t have cleats, and second, I have Sally in my head telling me if I can find a flat spot for my back wheel I might get traction. It works! Back wheel flat, bike at a 45 degree angle to the road ahead, peddle across the road, snake forward – and I’m OFF! See ya boys!! I complete Honister in 3 sections, rather pleased with myself, but becoming increasingly concerned I might miss this cut off. Foot down, speed up and I actually pass a few cyclists!! I arrive at the 12:00 cut-off at 12:01, where the Cut-Off Police tell 8 lads and me that: “the road ahead is twice as difficult as anything you’ve done yet”; he’ll only let us go if we guarantee we can manage it. We have 3.5 hours to do 25 miles before the next cut-off. Determined and Deluded says: “come on chaps, what are we waiting for?” I realise it’s me talking as I lead the way forward. For a minute. And then they all pass me. Ah well! Having made the cut off I can take a moment to enjoy the ride. The weather is grey and damp, but not too bad; the landscape is beautiful, and I have 3.5 hours to travel the distance I would usually complete in less than 2: all is well with the world. And then the wind came. I have completed some unpleasant weather events, and I consider myself a tough little tyke-on-a-bike, but I can honestly say I spent most of these 25 miles thinking I really might not complete. The hills over this section were very manageable, but the wind was just relentless, battering and howling; tearing at my bike and my soul. Urgh. I maintained focus by counting small milestones: if I get to 70 miles then it’s just 42 to go; if I get to 73 then it’s just 10 to the cut-off, and if I……. I arrived at the pre cut-off feed station with just minutes to spare. The Marshalls somehow ushered me in towards a cup of tea and slice of malt loaf, while another filled my water bottle. I suspect that Determined and Deluded was mostly just Dotty by now, as I mumbled: “the cut-off, the cut off” into my brew. Within a minute another Marshall was negotiating me kindly back to my bike saying: “you need to go now or you’ll miss the cut-off”…… and as I wiped the last malty crumb from my lips my feet were peddling yet again, back into the still fierce wind. It took me exactly 3.5 hours to do 25 miles, with no time to spare. Urgh. But once I knew I’d made that cut-off, the doubt fell from me in waves – I knew I would finish the event now. Determined and Deluded was back! 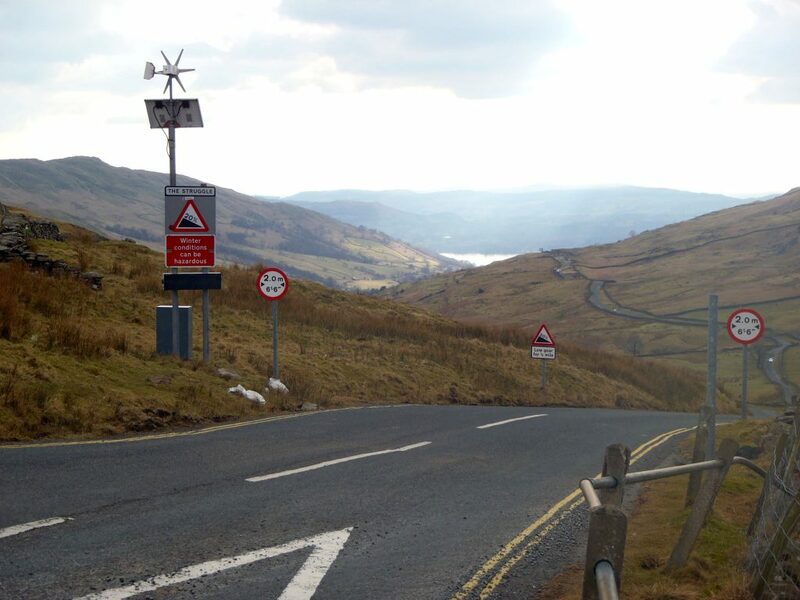 Hardknott Pass is just silly: lots of 30% uphill gradients and nonsense hairpin bends to play with your mind. By now, there was a few fellow Fredians walking up ahead of me, and it was encouraging to know I wasn’t absolutely alone. 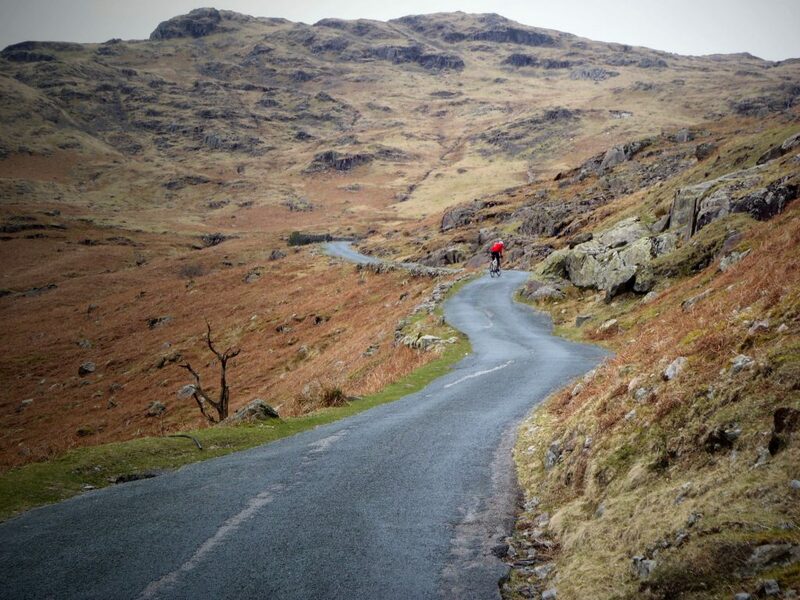 I knew that Hardknott was the ‘One to Conquer’ and I was going to peddle up this thing if it killed me. So I used my wee snaking technique to peddle up in about 8 sections, managing to cycle up all bar one final hairpin. I honestly enjoyed every single minute of this. I no way had the skill or strength to do this all in one go like many of my awesome VCM comrades, but I dug in and peddled what I could. Just an amazing feeling! While peddling up I passed red-jacket woman. This meant I wasn’t last and added to the fun! But on the scary descent, during which I hung on to my brakes for dear life, travelling at a pace that would shame a snail (even walking a couple of short sections), she passed me again. Humph. Then it was Wrynose Pass next, the final big climb of the day at around 100 miles in. I’d mentally built this climb up to be a monster; I didn’t realise I was actually ‘doing it’, while waiting for the hard bit. I passed red-jacket woman, (woooohooooo!) and peddled all the way up with just one short break. I couldn’t believe it when I reached the top and the Marshalls told me that was ‘it’! And then the Red-Clad Nemesis passed me going down again. Humph. And then it was just about 10 miles to go! Red-Clad Nemesis was nowhere in sight but by now I was determined to beat her. At mile 102 I found myself wishing for climbs so I could pass her. Determined and Deluded was clearly possessed by Delirious and Demented at this stage, but sure enough, the hills came, I spotted her in my sights, I peddled on up and past with a (probably not very sporting) glint of success in my eye – bye bye Red!! The remaining miles were just the most amazing ever. Yes I was tired, but I KNEW I was going to conquer. WHAT A FEELING! I turned in to the finish line with a total time of 11:49 and with the biggest smile on my face. I was so happy to see Fran, Sally, Anthony and Simon waiting for me. I babbled incoherent nonsense to all of them and insisting on hugging them all. Lots. The whole experience was just fantastic, and I’m so glad I was offered the opportunity to step out of my comfort zone and embrace a new challenge in these beautiful English hills. Here’s to the next adventure! 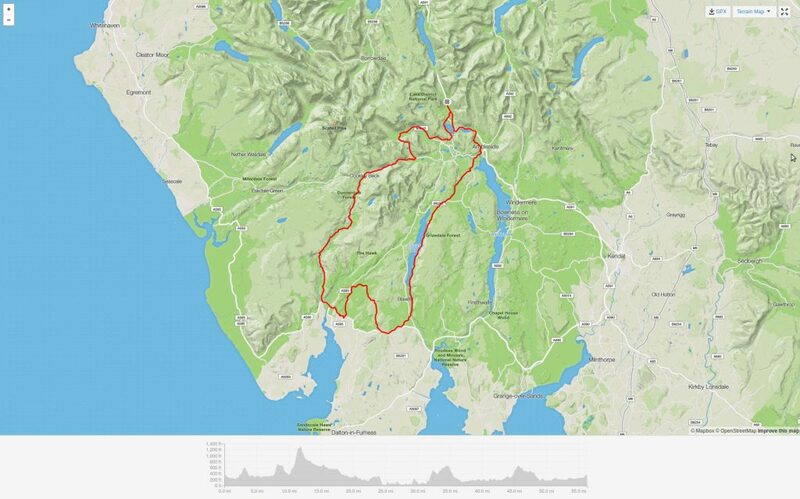 For me the mere mention of The Fred Whitton Challenge was an uncomfortable moment. It conjured up the cawing and flapping of startled crows, and the distant tolling of ancient bells indicating the onset of the end-of-days… on an overcast and foreboding day… in the rain… while lost. It was generally something I didn’t want to get any of on me. So – imagine my surprise when 2015 is my year for actually making the ballot. So – I was in. 112 miles and 13000ft of ascent, taking in a route involving all of the highland passes in the Lake Lands. Six daddy ‘named’ ascents, three boasting gradients over 25%. As you can imagine “I do not like hills” was ‘overjoyed’ with the news of a place. It is – within reason – for me, perfectly safe to enter ballots knowing full well you never get a place. That kind of luck has to run out at some point it would seem. A century or so in my legs this year, one of which at around 10k/ft mark and leaving me spent and with cramps. I was about as ready as I was going to be by the time Saturday came around. There we were – sat post dinner, (another) ale in my hand, trying to make some kind of sense of the wildly differing weather forecasts we had access to. 17C breezy, and dry – or 8C wet all day, little wind. 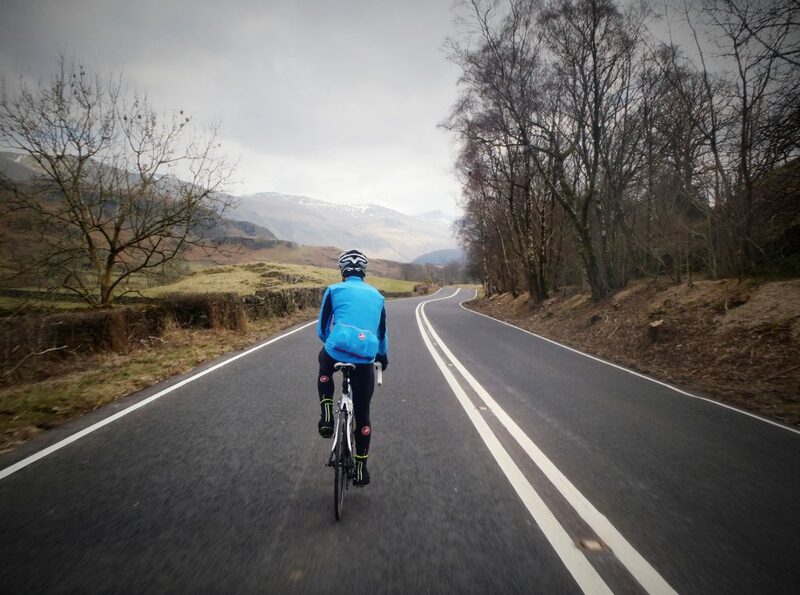 For those who do not ride – what this boils down to a wardrobe disaster waiting to happen – something regretfully always seems to catch me out. As someone who generates a lot of heat – being stuck in too many layers is my nemesis. The decision in the room was if we woke to torrential rain – and we don’t start. It’s not worth the risk or the torture. Experience says that once you are soaked through, miserable, slipped a few times, and losing sensation in your extremities – you would happily part with whatever the entry fee was to not be there. So this was a calculated risk – and one we were mostly all agreed on. After a sleepless night – 5am arrived. It has been a very long time indeed since I last slept in a bunk. Four growed-up’s full of food, beer, and foreboding cat napped their way through the night, and with all the precision of freshly woken hibernating bears, grunted and shuffled their way through the 5am alarm and systematically like a production line through the single shower. This was an unrehearsed and non communicative ballet that was a miracle to behold. Moments later it came to putting food and coffee into their faces surrounded by familiar faces, and half clad fellow cyclists. A curious feeling of being above brethren in a monastic kind of way – to the left of me, to the right of me – coffee, porridge, eggs, toast, clad in layers of armour for the day ahead. Blue clear skies swept away in the space of a bowl of porridge disappearing. Replaced with a view of a wet world outside the kitchen window. Look at what you could have won. Not put off we pulled together our things and made for the door. Bags. Cars/Vans. Doors shut. Engines. Road. Queues. Windscreen wipers. Grumpy looking groups of riders heading the opposite way, tyres hissing through surface water. Shoes on, bikes out, pockets stuffed, spot fellow-club-members-in-huge-grass-car-park, decide you need to brave the toilet after-all, and assemble for the start gate. Light rain was the order for the day. Wet roads. Group of four. Sally is in for a quick 50 – only doing the first climb and back (broken thumb and pelvis and all), the rest are in for the long run. 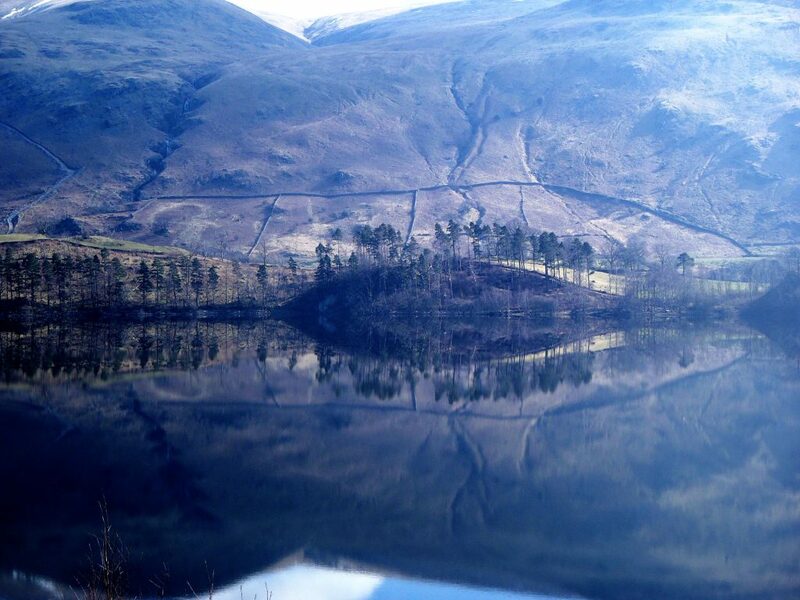 The first real hill is Kirkstone at 454m it is the highest point of the day. It is an ascent that you can feel in your legs – but it is all still talking and smiles – not the standing, stomach compressed, having deep and encouraging conversation with your soul type. Re-grouping at the top, the marshals make with some serious and repeated warnings. Sure – you think they are just saying brakes, keep speed right down, slow, slippy – “I bet they always say that” meets “how hard can it be“. But you have equally seen the ambulances going by while you were making your way up. Hmmm. Introduction to the hills of the lakes 101. Brakes. All of the brakes. Letting off for bumps or mud on road then hard back on. In the wet. They meant every word. You find yourself wondering “can I ease off yet” – eventually I see straight ahead and ease off, and the pace is good. Reminding myself of the mantra ‘start slow, stay slow’ – bigger gears, but BPM low. The day becomes more of a blur. Rain starts, rain stops, moments of sunshine, more rain. There is a LOT of climbing, but it is not the hill reps from hell I had been imagining it would be. My group of two saw Si and I make good progress. Onto roads I recognize, into Keswick and out again. As fate would have it – we stop for comfort brake – and so-unlike-mat-to-be-playing-catch-up – but Mat rides by. Happy familiar faces, rain. We are now three. Bikes – onwards. The weather is there, you are wet but comfortable its reached a kind of point where you are not noticing or not caring or something. We round a bend and suddenly the road is taking no prisoners and it is kicking up shows no sign of letting off. Cars (a statistically unlikely proportion of Mercedes with elderly drivers), mostly pulling over to let each other pass. Riders are trying to stay on. A few early walkers – but weaving between cars and walking riders was a dream. People teetering, and people trying to zig zag up the foot of the climb. #winning. Still – there was a nice stream down to our left, and I got to push a few others back into riding. Levelling off for a bit I am back on and in the game again just in time to see the road meandering up proper. This is another steep climb but not mental. No breathing-through-eyes required. Honister pass is now in the bag. Mix of marshals and mountain rescue this time. They are even more keen about brakes – and I have learned my lesson – there will be no seeing how it goes. Stopped to regroup with Matt and Si, and down the other side… backside off the back of the saddle – tarmac rippled from cavitation (the tarmac will not stay flat on gradients like that – it forms waves as it collects in steps…. wet steps… of varying traction. Nice. The view was stunning. 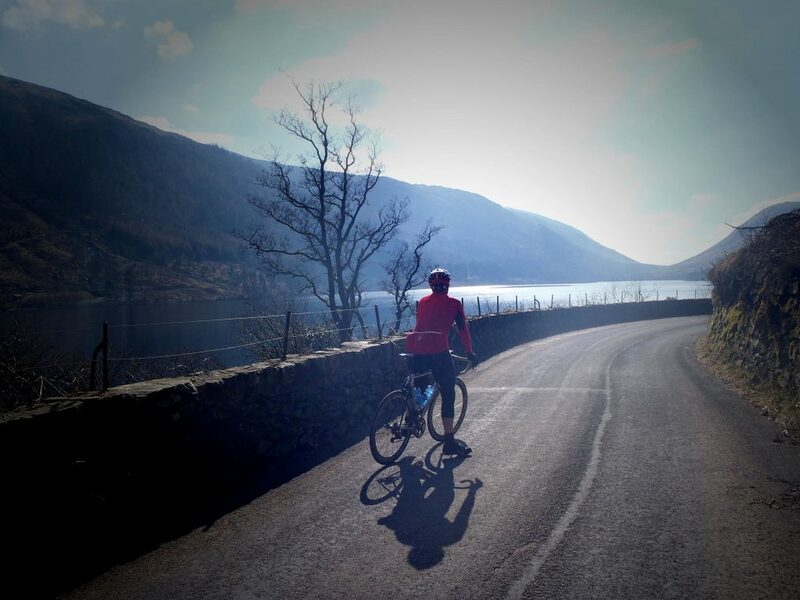 Hugely life affirming feeling of staying alive as best you can as whizzing down the descent with a heady and saturated world of colours – grass, rocks, water, gravel, hills, speed. There were ZERO pictures as both arms were fully busy with staying on the bike and keeping the speed down. Amazing. The kind of moments you see in your dreams. 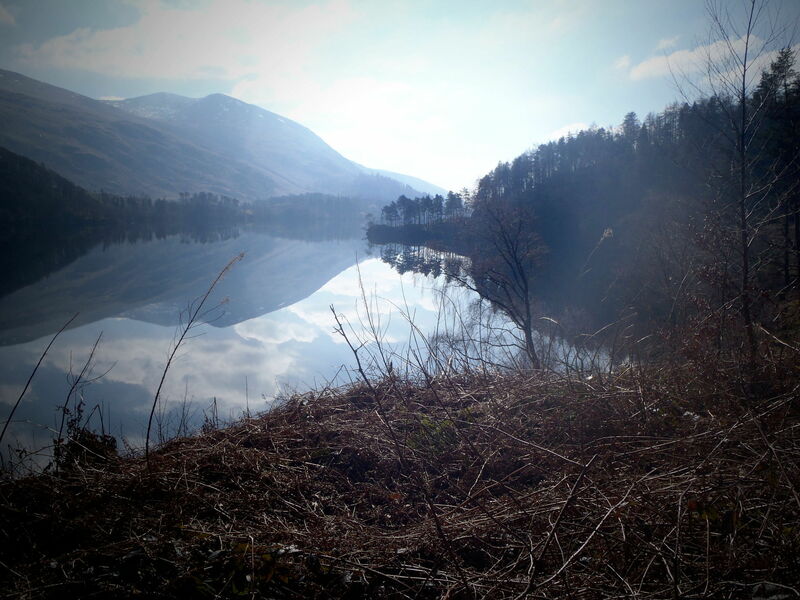 To Buttermere – and the first food stop is upon us at around 50 miles. Almost a surprise in many ways. Here, now? “you have 10 miles to cover to the cut off point – and you have 50 minutes – there is a timed pass between here and there”. Chewing continues now at a more rapid rate, and we make haste to our bikes like so many WWII Spitfire pilots to their steeds. 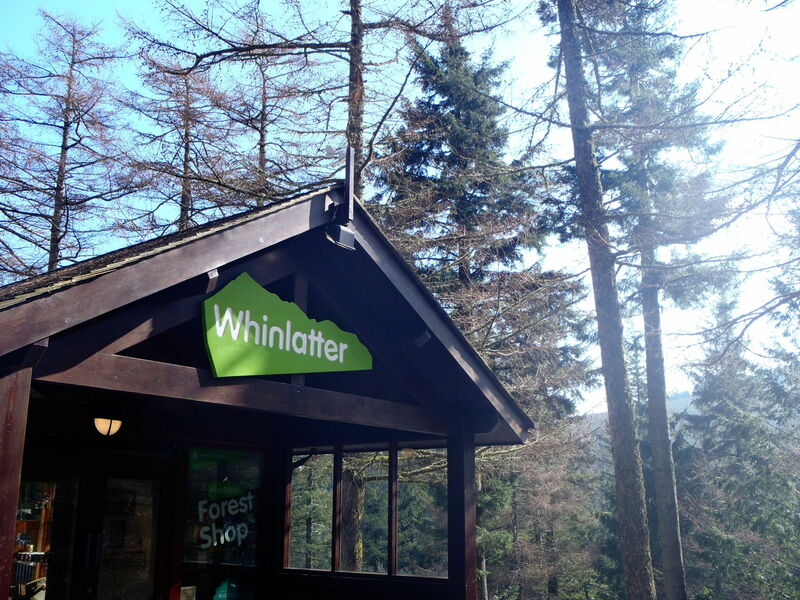 Out of the car park and right – then before us the ascent. Pretty much all visible. Who builds roads like this? How is this fair? Why do I now have two FULL water bottles and a belly full of food? Not my finest planning moment. We climb again into the mist, height gain is regular, linear, walkers (with bikes) come and go – and to be fair are not going a great deal slower than we are. I was starting to holding back the group. I told Si and Mat to make haste, and I would make my own way. I watched as they got progressively smaller, and then, eventually disappeared from view. On my own now – riding style changes accordingly. The descent however – this was different – a little steep to start with then open views of corners – less brakes for this one , more rocket sled. I was now passing people who passed me on the way up. Two people tagged along for the ride in my substantial draft – I was up for that – these were good times. Little in – lots out. Skull and crossbones sign shot into view, and a switch back lost us about two stories of height in two bends…. and back on the pace. Into Braithwaite and through the cut off with 20 mins to spare. Left out of the village, and up again. Up up up. Nothing epic – just bucketfuls of the stuff. Forestry sided the roads, so many people out. Passing and being passed now. Drivers waiting for traffic, windows down shouting encouragement, cow bells by the side of the road, so many people, then tents, car parks, mountain-bikers at the side of the road cheering us on. This was something special. This was different to other rides. Who where all these people – how long had they been standing there in the rain. Children, pensioners, cow bells, and shouting out support… it all felt very personal… one of two thousand – it was personal for all of us. Amazing. The rain is backing off but the wind is building. It had been behind me, and moving around as we make our way around the circuit. Making progress on my own now, rolling scenery, and moving from group to group – on my own – no club mates in site, just plodding on – keeping it steady… then who should I see just stopping at the side of the road, Mat and Si again. Great success! The wind is now not a funny thing. Drafting people as best you can as you make a slow motion ascent into wind. Crosswinds buffeting me constantly – whipping in through gates and fence lines. Lighter weight Mat is complaining the most. In fact he is complaining a lot. Si and I of the same weight and height, and say nothing, just a glance at the deep section wheels / sails we are sporting. Nice. The descent is upon us and there is a lot of steering going on that we are not necessarily sanctioning. But strength in a group is a happy place. The next climb kicks off big style. I can hear up ahead the noise of cow bells and clown-car-horns – the type you would hear in the Tour de France. Smiles. People are on both sides of the road, they are holding out things like chocolate and shortbread… but shouting there is a feed station up ahead. Foolishly I read this as “up ahead” and also thought this was likely to be the brow of the hill. No, such, luck. The climb wound up. I caught Mat again – he was not in a happy place… commensurate with me catching a racing snake, uphill, into wind. He muttered something about ‘Elephants on his back’ and I moved on. I caught a group of riders who were huddled together – a proper moving echelon of people desperate to eek out an existence on this hillside that was as wind free as possible. Fluid is not a word I would use, but we chopped and changed and rode down hill into the wind together, people jumping into the group as we passed. It was as good as it was ever going to get up here – this was not fun. We were having to work now while descending. What looked like an industrial area, maybe a dock, or an airfield was ahead of us… it was one hell of a blot on what thus far had been a landscape effected only by the odd quarry or town…. as I got closer I realised it was Sellafield… that would do it! Calder Bridge – food stop. Car park, tables outside a hall. An awful lot of bikes, but not so many people. I filled my bottles and could hear the din from inside the hall, and people coming out with what… surely not… could it be true? Hot beverages in flimsy plastic cups of joy?! In we went. Heaven. Immediately lit up by heating lamps, we wandered in the out door, and around the building to the in door to join the queue. Banana sandwiches – oh yes. I am not a fan of generic non proved bread, and bananas – they do not agree with me. At all. However to find these together, in a holdable form in the queue for sugary tea (again which I do not drink) 90 miles into a wet and hilly ride was many banana smelling slices of heaven. Just when I thought it couldn’t get any better, familiar voices of Donna and Paul who had table space – and chairs! The trick here was clearly going to be getting back out on our bikes again…. after-all… feed stop only 30 miles from the end… why would you… oh…. oh dear – Hardnott and Wrynose lay ahead. An impromptu round of Jenga unstacking our bikes – we set off. I had clearly hooked by Di2 cable on someone’s quick release and unplugged the cable. First I knew of this was climbing out of the village. O kept hitting the lever to shift up the cassette but feeling no discernible difference. Looking back I see the cable and socket dancing perilously between chain and teeth – about to meet its maker. Stop, plug in, pray, merciful gods, gear-go-up-gear-go-down, and continue. Phew. Team of five now – we are in good shape and good spirits, even Mat has clearly lost his Elephants, and the sun is out – great success. We are chatting, its all very pretty, all is good, not a care in the world and a mere 90 miles or so in our legs. Happy days. 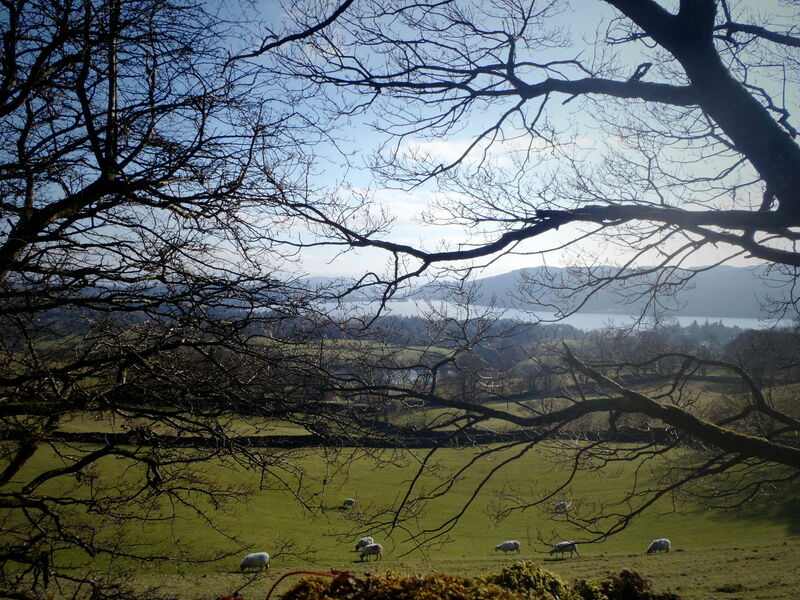 It seems fairly innocuous enough – there you are on the valley floor, with two hills overlapping ahead. It starts to head up – curving – switching back on itself gaining height very very quickly indeed. Then again. Before reaching the top. 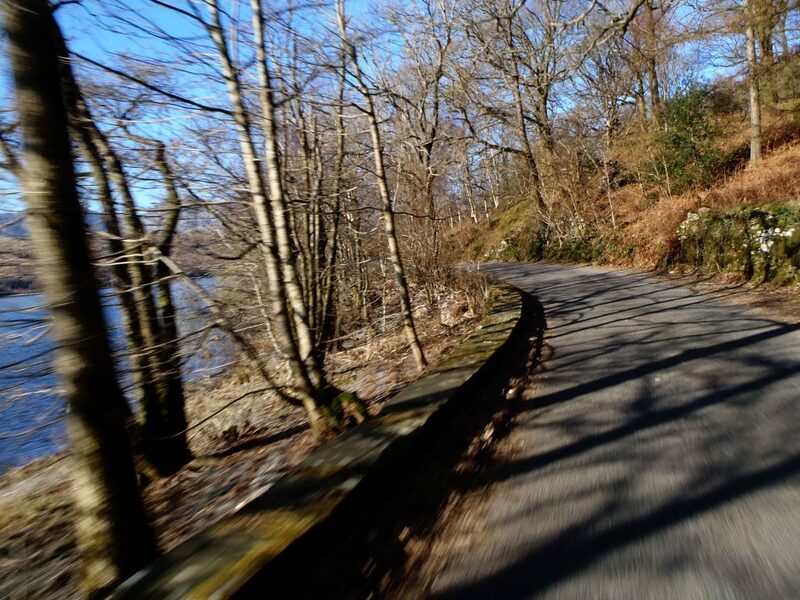 No Bwlch Penbaras is our local hill-with-a-comedy-corner – each of these switchbacks was more than a match for that one left hander. This was no laughing matter. Those ‘rambling’ by this point had a hard enough job pushing their bikes up this – the pain in the shins and calves was remarkable – this was a real climb with real moments of 30%. Walkers being cursed at – as those still on their bikes by this point really were not going very much faster at all, hard to pick out over your shoulder, not least of all since their routes were defined by their need to balance. Top dead centre was like a black hole where riders got sucked into walking… with the odd faller here and there. It was late in the day – and while some would say they ‘failed’ – I say they saw sense… for those who where hesitating – for those who were still feeling okay – it was okay to not risk it. Riding between crazy steep parts was a blessing – feeling so much easier than walking up those gradients. Walking was no soft option. The burning was quick to go, and the smoothness of pedalling over stabbing cleats down onto a wet tarmac slope was an easy choice. A car on the switch back stinking of clutch and tyre smoke was stuck. Wet tarmac, in uneven step like waves, and lack of momentum – it was essentially beached. The stench and the noise of spinning tyres, as vehicles gathered in front and behind it. Rather be us than them right then. Every time. By this point in the day – my dislike of descending on the drops had been discarded as a pointless thing – and if I wanted to not end off hugging a rock or down a ravine – then I needed to pull those levers from the drops…. backside hung well off the back of the saddle, road thankfully drier now, although the unwelcome waves of the cavitation causing my front wheel to shud-d-der. The road snaked left and right dropping away – the most picturesque of stone bridges and colours, oh the colours, OH THE NEED NOT TO ENGAGE INTIMATELY WITH THE SCENERY! I pulled up on some gravel on the almost level alongside Paul, my hands were cooked from pulling on the levers, and reached for my camera. It was beautiful. The hardest part was now done, the journey had made just being there all the better. The camera fails to capture the elation of just being here, right now. Rolling on, and switching left and right before a section that felt actually concave in descent before marshals and a house…. 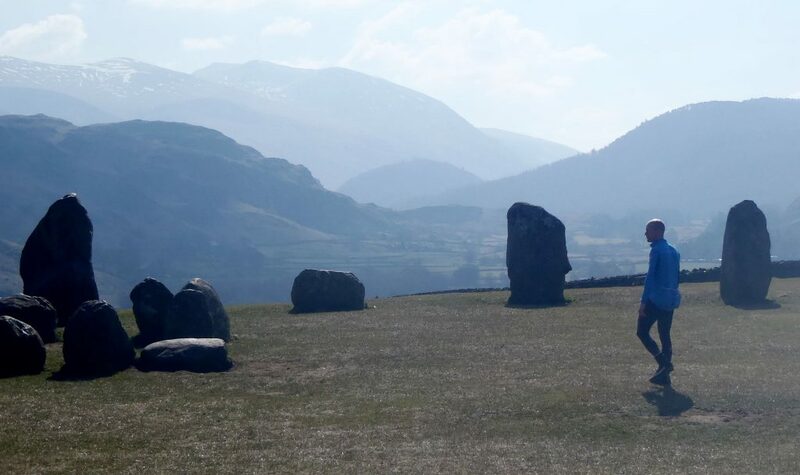 it would appear the Hardknott Pass ends in someone’s front garden – then left and “next!”. Just the Wrynose now… everything I had read suggested it was equally wonderful – just less of it – having failed to drop down again. Progress across the picturesque valley between passes was alongside a gorgeous river. Hills of greens and browns, and water of grey gleaming rocks. Ah. Okay. 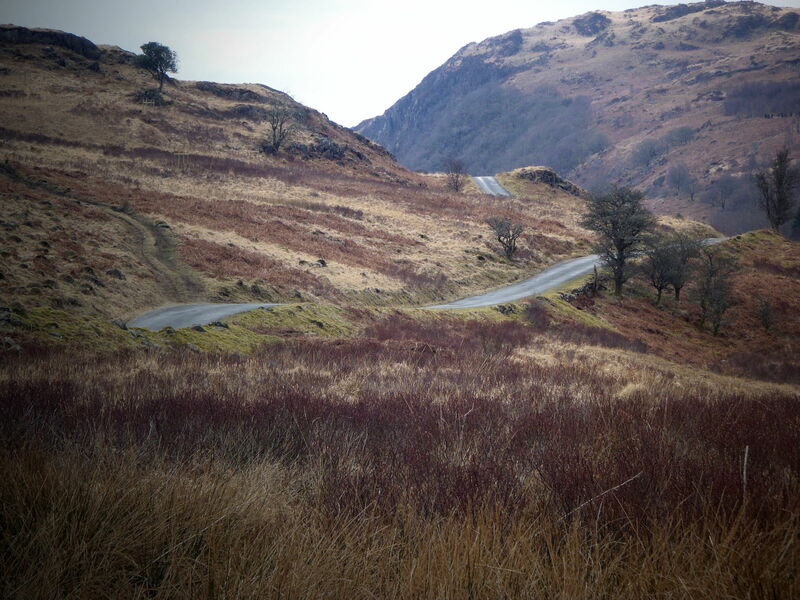 Slapped back into reality as I make out the meandering road with coloured dots on it ahead. Last monster to slay – and here I was with Paul and Donna. Pushing now a little further up, holding onto the bike, a slip, a ramble, back on, a bit more riding, another ramble – back on and over as the cutting rose towards the sky. Just as we round the corner to the top Donna points out the 10 miles to the finish sign lent up against a boulder. I maintain this was a lie. A cruel and unfair lie. That or a mirage – as it would appear we were the only ones to have seen it. Over the top, and now watching the brakeless mad lass disappear away from me a lot more confident in her brakes and tyres than I was (not to mention physics and ability to stop and steer while dropping-from-a-plane over undulating tarmac through bends). Catching up once it levelled out we hauled each other along – a marshal shouts out 7 miles to go. Leading out a stream of riders from Team XIII, and back to the lake. 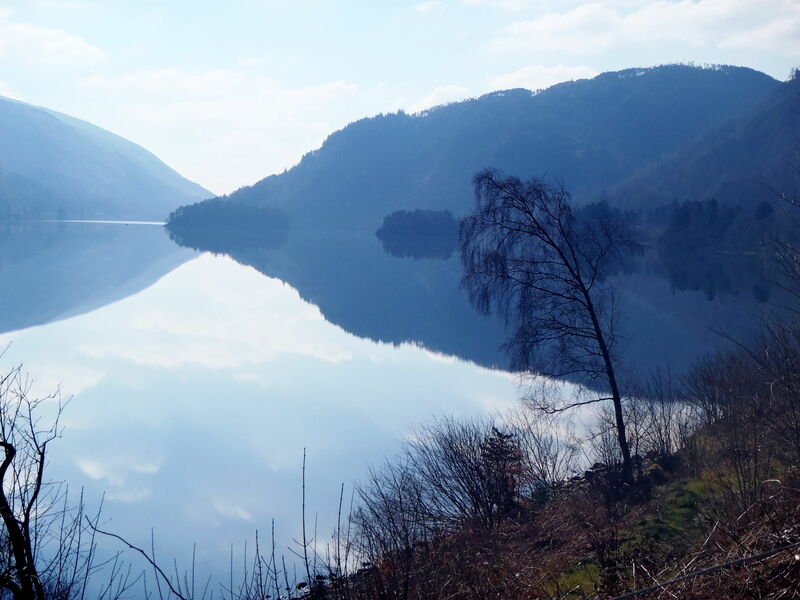 The lake we headed out alongside, it arcs into view on our right – somehow feeling like it should be on our left (not a circle – heading back on same road – realise that now). Donna chirps up “it’s the end of this lake”. Drafting as best we can now, slowing up as the ground rises and the long line of riders doesn’t take the front – but goes wide and drops us. How long is this lake? The roundabout comes into sight, and we ease up – glancing up I recognise Sally and Fran by the roadside taking pictures. Big smiles, big relief. The large inflatable gateway, and marshals directing us onto what I can only describe sheet ice plates with gaps and steps as we head under the timing arch, and into then pen. Off the bikes…. looks of disbeliefs and mild panic as we have no idea where anyone is. Collecting our timing printouts, and fumbling for our phones to catch up with our friends…. we were done. There is changing in the back of a van, there is fumbled recovery of meal ticket resulting in pie, beans and gravy (genius move) with a cup-o-tea . So many smiley elated faces. This was an emotional thing. Without a doubt – the first event I have ever finished feeling so elated. So proud. So smiley. We did a thing. We had about six hours of rain. We got around in ten hours. A sense of achievement I had not managed before. This was a good thing. 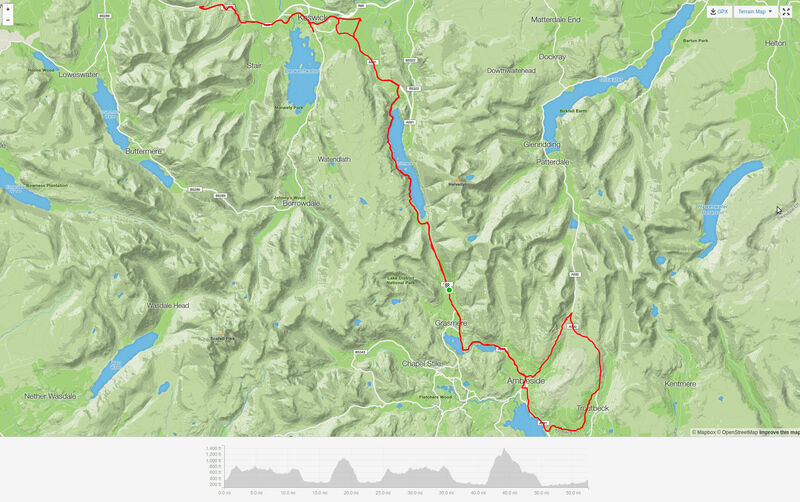 The Fred Whitton Challenge. Not the kind of event you bring up in polite conversation. Wisely named as a challenge as opposed to a sportive – a self proclaimed Le Marmott . 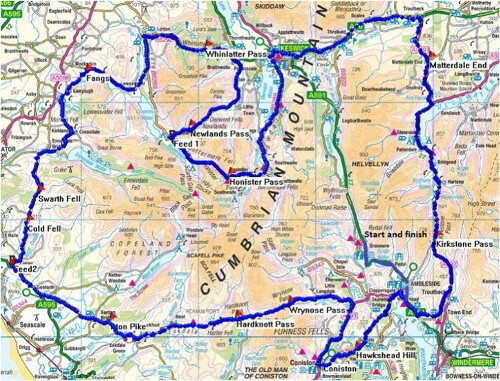 This is 112 miles with 10,800ft of climbing through the picturesque Lake District with such ‘memorable’ gentle ascents as the Kirkstone, Honister, Newlands, Whinlatter, Wrynose & Hardknott (an absolute gem at 100 miles). 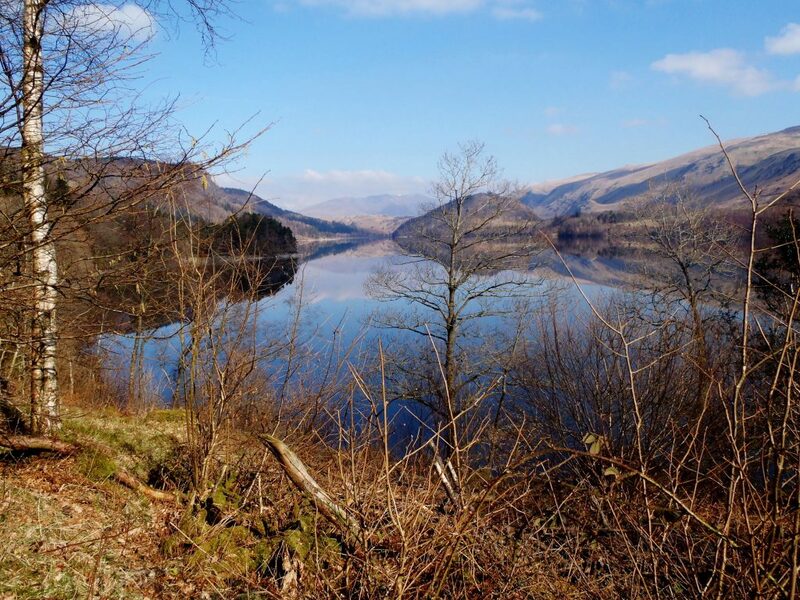 All adding up to be one of the most challenging group start events in the UK with distance, steep gradients, winding descents, and a history of terrible weather. So … obviously in the tradition of “seemed like a good idea at the time” – VCM put forward a number of teams and individual entries into the ballot. Confirmations on success were sent out on the 10th January 2015. The following names made the ballot. These 13 brave souls piped up on social media with an initial “GREAT SUCCESS” followed by an almost immediate and universal “… WHAT ON EARTH HAVE I DONE“. As a distant church bell chimes and croaking crows flap into the distance – the following ponder the challenge ahead. We would like to wish them good luck in their preparation. A full list of lucky souls can be found on their site – along with a breakdown of the route for those who are interested.